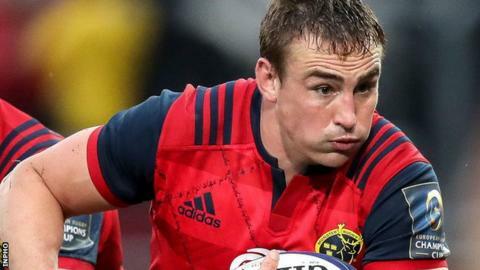 Munster survived a late French rally to record their first Champions Cup win of the season at Thomond Park. Terrible weather conditions contributed to a poor game which was scoreless until Conor Murray's 60th minute try. Andrew Conway darted over in the corner 10 minutes later with Ian Keatley converting both sideline conversions. Racing's bench made an impact, Leone Nakarawa crashing over with five minutes remaining as they applied late pressure but Munster hung on. The Thomond Park crowd commemorated the first anniversary of the tragic death of their former head coach Anthony Foley with a minute's applause. The game was a disappointment and All Blacks' legend Dan Carter was subdued on his return to full fitness, picking up a leg injury in the second minute before going off early in the second half. The slow tempo resulted in a lethargic opening half and it wasn't until a brilliant off-load by Simon Zebo after the interval that the crowd became engaged. Racing captain Maxime Machenaud's sloppy kick was charged down by Murray, who sprinted for the line and slid in for the game's opening score after the hour mark. Munster had a good spell of pressure with good go-forward ball by the forwards and after 10 phases Conway gathered Rory Scannell's pass and darted over in the corner. Racing appeared disinterested for long spells but their bench influenced the final 10 minutes and Nakarawa bundled over to set up a tense finale. The visitors had a lineout close to the Munster line in the final minute but didn't take the opportunity to leave Limerick with anything more than a losing bonus point, as Munster joined Leicester at the top of the pool. Munster: Zebo; Sweetnam, Farrell, Scannell, Earls; Keatley, Murray; Kilcoyne, Marshall, Archer; Kleyn, Holland; O'Mahony (capt), O'Donnell, Stander. Replacements: O'Byrne, O'Connor, Ryan, Flanagan, O'Donoghue, Williams, Hanrahan, Conway. Racing 92: Lambie; Rokocoko, Chavancy, Tuitavke, Dupichot; Carter, Machenaud; Ben Arous, Chat, Tameifuna; Le Roux, Nakarawa; Lauret, Nyanga, Claassen. Replacements: Szarzewski, Afatia, Johnston, Chouzenoux, Maka, Iribaren, Tales, Vulivuli. Read more on Man City v Tottenham under way - more drama to come?